Home Beauty What is Hydrolyzed Collagen and why do I need it? What is Hydrolyzed Collagen and why do I need it? So we received an offer in our mailbox from Puritan’s Pride today. It’s an offer for a bottle of FREE Hydrolyzed Collagen 1000 mg with ANY $10 Order + Free Shipping! Being ladies of a certain age, loss of skin elasticity due to depletion of collagen is a major concern for us. Frankly, even if you’re in your 20s you need to start bolstering your skin so that when you get to your mid thirties and beyond your skin won’t begin to slacken and loosen and sag and make you look older than you would like to look. But what exactly is hydrolyzed collagen? And what benefit will it be to us to try Puritan’s Pride’s hydrolyzed collagen supplements? Will it make us look like we’re 20 again? Hydrolyzed collagen is produced from collagen found in the bones, skin, and connective tissue of animals such as cattle, fish, horses, pigs, and rabbits. The process of hydrolysis involves breaking down the molecular bonds between individual collagen strands using combinations of heat, acids, alkalis, or enzymes. Typically, with skin-sourced collagen, hides are put in a lime slurry pit for up to 3 months, loosening collagen bonds; the hides are then washed to remove lime, and the collagen extracted in boiling water. The extracted collagen is evaporator concentrated, desiccated with drum driers, and pulverized. The process by which hydrolyzed collagen is produced hardly sounds glamorous but the product is supposed to help you maintain tight, supple youthful skin, strong healthy hair and strong healthy nails. All the good things we want. So are we going to take Puritan’s Pride up on their offer of a free bottle of their hydrolyzed collagen? We’re not sure yet. We’re thinking about it; but we’re not big on taking supplements, and even though these are claimed to have none of the things we usually try to avoid, such as dairy, soy, gluten, sugar etc., we still have to be careful about what we put in our body. We’ll have to do some more reading on hydrolyzed collagen and find some more reviews of hydrolyzed collagen products. 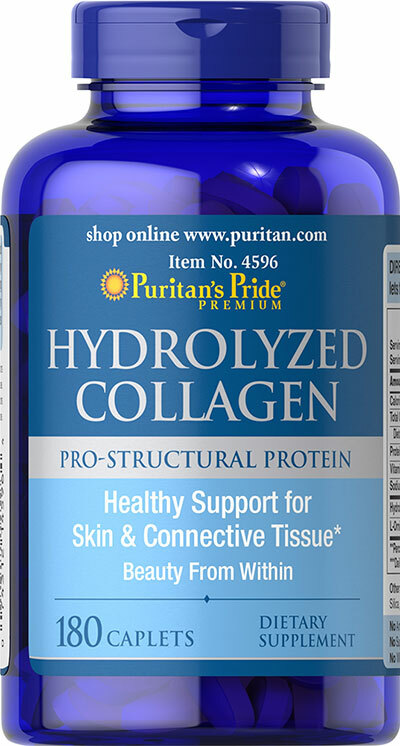 If we find enough raving reviews that hydrolyzed collagen will give us back the skin we had at 25 (or at least make our face look a little firmer even if it can’t take us all the way back to 25) we’ll go on over and buy something from Puritan’s Pride so we can claim our free bottle of their hydrolyzed collagen. There are some reviews on the Puritan’s Pride website in case you’re curious to try the product but want to know what customers are saying about it. Note that the reviews are from 2012. All comments mention that the pills are too big. We don’t know if Puritan’s Pride has since made them smaller. Puritan should consider selling collagen powder instead of pills! But overall this product is effective. I can notice my neck becoming firmer after only one week. Yes the pills are large, but unless you have dental issues you can chew on them, though they might not be to everyone’s taste. My personal tastes likes chalky things so I’ll chew on them like a snack while working or watching a show. In the end the price is great and they work well, so I’ll keep taking them no matter the size. However if they could come out with a smaller version that would be great. I love all of the Puritan products EXCEPT these chalky rock-like horse pills! They are impossible to swallow, and when I attempt to break them up, they feel like they will crack my teeth. I have cut my throat swallowing the broken up chunks. They also have a nauseating taste, like you are trying to swallow fish bones! I feel that I have wasted my money, especially since I bought on the buy one get two free! Maybe my kids can use them to write on the side walk!